Perhaps this post is a bit late, but I wanted to get my thoughts out regardless. PAX East 2015 (that’s Penny Arcade Expo) was two weekends ago, and I had the amazing opportunity to attend the convention on Saturday. I’m no stranger to cons, but all of my experience has been with anime conventions; namely ConnectiCon, Otakon, and Anime Boston. A video game convention was a new experience, with slightly different rules and ideas about what to do with your day. At anime conventions I’m used to doing a lot of people watching; focusing on checking out all the costumes. Costumes are part of the PAX experience, but they felt more like background details; fun to see, but not one of the main drives. Both kinds of conventions have panels where you can go to learn more about some series or hobby or to listen to a discussion on some other topic, but again at PAX these did not seem to be the main drive for attendees. Every anime con I’ve been to has had a Dealer’s Room, where larger companies set up booths to sell apparel and memorabilia. An Artist’s Alley is also present, usually a separate room where more casual vendors can sell their art (both fanart and art of their own original work). But what PAX has is slightly different. There is no Artist’s Alley at all (from what I experienced), and the closest equivalent to a Dealer’s Room at PAX is like a dealer’s room on steroids; the Expo Hall. PAX is all about video games; I mean “arcade expo” is right in the name. And the main attraction is video games, specifically publishers and developers showing off their newest titles. Attendees can get their first playtime with new games, some of which are still in their pre-alpha stage. Hardware manufacturers are present, and they have PC builds where people can play well known games like League of Legends; some even held raffles where you could win graphics cards, keyboards, headsets, and other peripherals. Free swag is a big factor for PAX; you want to get to the booths early in order to get cool free stuff like light-up lanyards, flash drives, and tabletop figures. But as I said, the video games are the main attraction. PAX East 2015 had a number of popular developers present; 343 Industries was showing off Halo 5, Hi-Rez Studios had SMITE for the Xbox One, and there were numerous indie developers showing off video game titles like Warhammer: Dark Nexus Arena and tabletop games like Project A.E.G.I.S. Unfortunately, I was not able to actually play any games while at PAX; the lines were huge and I felt a tad overwhelmed. However, I did take the time to look at the games on display, and I saw a lot of interesting titles that I will be following closely. These are my top three favorite games from PAX East. Feel free to click on the titles to be taken to a trailer for each game. Developed by Motiga, Gigantic is a MOBA/Action RPG/First-Person Shooter hybrid that focuses a lot on PvP. 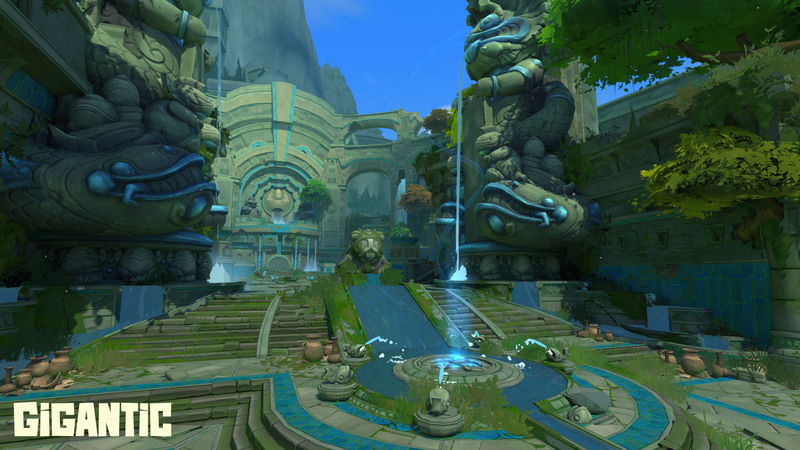 Players control a champion and run around a large map in a third-person view. The goal of the game is for your team to secure objectives and strengthen your Guardian, a large beast that functions similarly to a League of Legends Nexus but has the ability to fight on its own, so that you can do battle against the enemy team’s own Guardian and bring it down. I gotta be honest, I was never overly interested in SMITE. The only MOBA I play with any regularity (and love) is League of Legends, and while SMITE‘s third-person camera is interesting it didn’t draw me in. Gigantic, however, feels different in a way that I can’t explain. Perhaps it’s because SMITE feels too much like a literal port of League with a different camera angle, while Gigantic feels like a different game entirely. 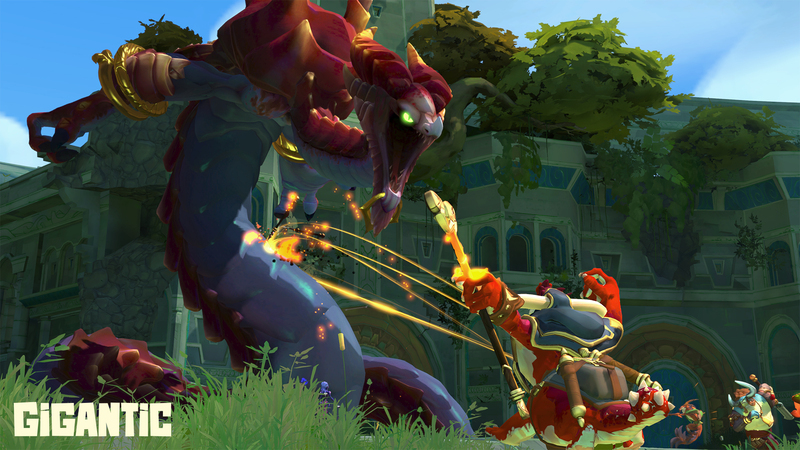 There are no lanes and more open freedom in Gigantic, and the possibility for strategy and terrain tactics is readily apparent from gameplay videos. What a beautiful, sacred garden. Let’s murder people in it. The art is also extremely well done and the animations are very smooth. The game has a very cartoony feel to it, similar in style to Team Fortress 2‘s art direction but leaned more heavily toward vibrant colors and oriental themes. I admit the game carries a very heavy Mists of Pandaria and Samurai Jack feel to me, but that is a motif that I’ve always enjoyed. I’ve grown a bit tired of boring grays and browns dominating the gaming market. The”hyper realistic” and “grittier” art direction of some games like the new Tomb Raider franchise or The Elder Scrolls V: Skyrim can work very well (and in fact my top pick later in this post has exactly that), but a game like Gigantic shines because of its bright colors. Look at how smooth and colorful this is. It’s even better when moving. 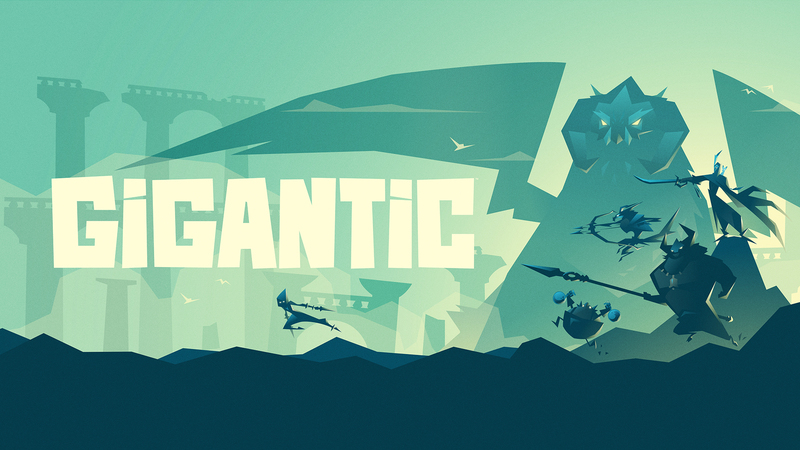 Gigantic is still in its alpha stage and will be available for PC and Xbox One sometime in 2015. Blizzard is moving into the FPS genre, and Overwatch is there much-hyped answer to Team Fortress 2. I admit for whatever reason I initially thought Overwatch was a MOBA similar in design to SMITE (but with a first-person view), and I’ve already expressed my opinion of SMITE earlier in this post. The game looked interesting and gave me a strong Necessary Evil vibe (a supplement for the Savage Worlds RPG system which allows you to create your own superhero/villain), but wasn’t something I planned on picking up. Then I found out it’s an FPS similar to Team Fortress 2. I don’t have a large amount of experience with TF2, but I certainly enjoyed it when I played, and the concept of superheroes and supervillains duking it out in such a setting, rather than relatively normal people running around with guns, is actually pretty cool. A number of characters have already been revealed, from the quirky Tracer to the hulking Reinhardt. There’s even a supped-up talking gorilla (and the reason for my Savage World’s vibe, as in one game a friend of mine played a talking albino gorilla that could shrink at will). And each has special abilities that allow them to traverse the battlefield quickly and fight their enemies. Tracer, for example, can “Blink” to teleport forward a short distance and also has the ability to “Recall,” which rewinds time for her so that her health, ammo, and position return to what they were a few seconds ago. Winston, that talking gorilla, is a dedicated tank with a jet pack and a shield. A talking gorilla with a jet pack is pretty awesome no matter who you are. Personally I think I’m most interested in Reaper, Reinhardt, and Mercy. Blizzard likely has plans to release even more characters than these over time, a la League of Legends. With PAXEast Blizzard revealed two additional characters; McCree (a gunslinging cowboy) and Zarya, a strong armor-glad tank. 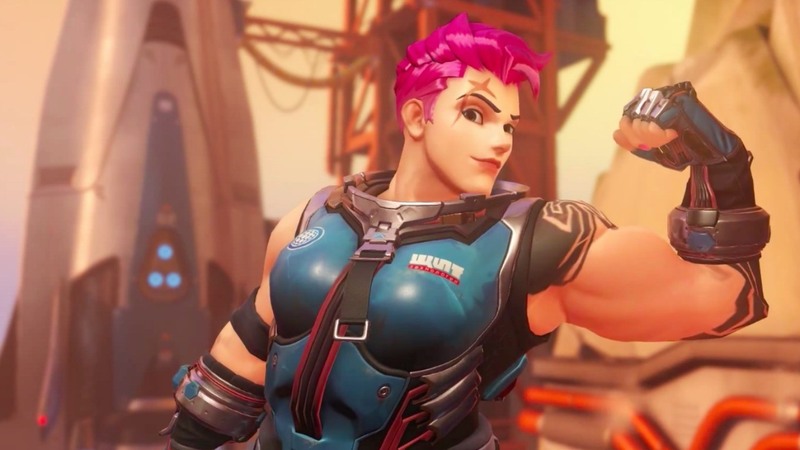 Zarya is particularly interesting and refreshing; the other women in the game have noticeably svelte body types, and Blizzard faced a bit of heavy criticism for it. Then Zarya was released, a woman with a large frame who could probably go toe-to-toe with Winston the gorilla in a straight melee brawl. I applaud Blizzard for trying to swing away from female stereotypes in video games. I’m not sure whether she was already in development, Blizzard remade a male character to be female, or she was made completely from scratch after hearing the critique, but either way it’s a step in the right direction. She’ll use that bicep to crush your skull like an over-ripened watermelon. Artistically the game is similar to Gigantic in that is has a lot of bright colors. But unlike Gigantic, which leans heavily toward a cartoon-like design and motif, Overwatch aims for a bit of realism. It reminds me of a Pixar movie (and who doesn’t like Pixar? ), which offers up realism while also providing room for exaggerated features. Overwatch will be entering a closed beta later in the year, and will likely see release sometime in 2016. I think it will be a definite buy for me, personally. The link above is a developer commentary gameplay video; the only existing trailer that I could find is a teaser trailer that doesn’t tell you much about the game. Not very well known is the fact that I absolutely LOVE space ships. Fighters are cool and all, but I’m in love with larger capital ships; frigates, corvettes, destroyers, cruisers, carriers, and DREADNOUGHTS! 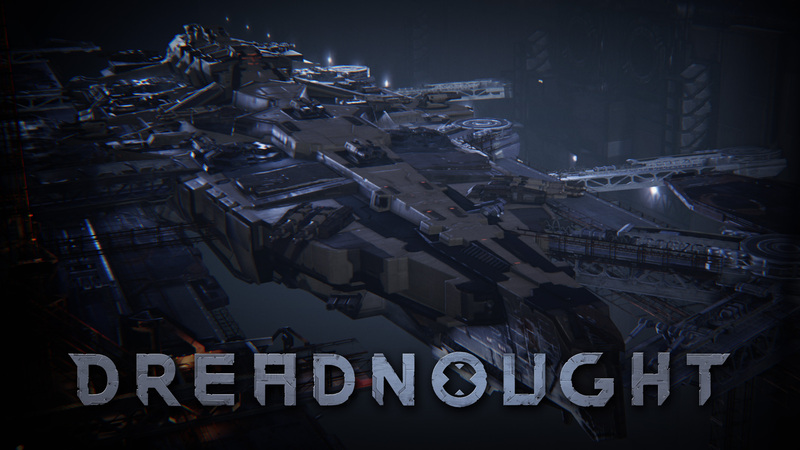 Dreadnought is a PvP-based flying combat simulator in development by Yager Development where players control a large space ship and battle other players in a 5v5 PvP match. It’s not space-based per say the way Star Wars: Battlefront 2 included battles in space. 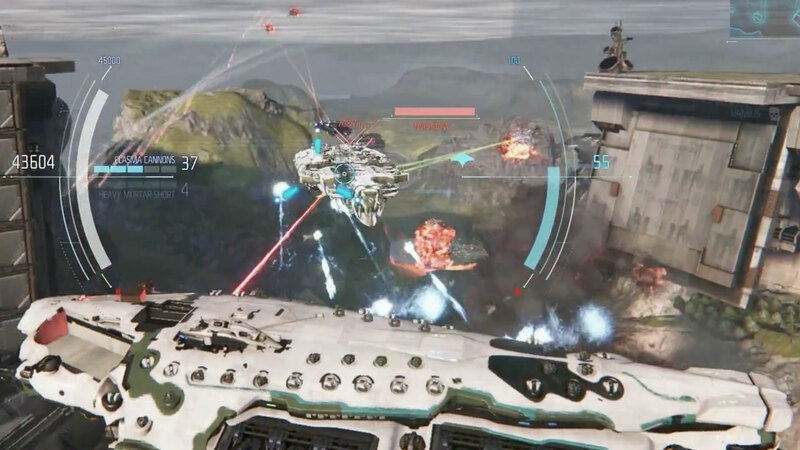 In Dreadnought you are flying quite close to the ground, battling in the air directly over a planet rather than in deep space or upper orbit. It’s always awe inspiring when a gigantic capital ship flies by a structure; imagine the expressions of anyone on the ground during this engagement. The ship designs are quite interesting and each ship type is visibly unique. Like in Battlefront or Team Fortress 2 players choose different classes of ships to fulfill different roles, with each class having particular strengths and weaknesses and abilities. There is a quick, fast moving corvette that can “blink jump” very quickly to evade fire, a support cruiser that can heal its allies, and a larger, bulkier dreadnought class that can take and dish out a lot of punishment but moves very slowly. And other classes besides those also exist. Each ship has four abilities hot-keyed to the 1-4 keys, and you as the player have the ability to completely customize what abilities your ship has similar to how you can customize your loadout in games like Call of Duty. The game is a different kind of PvP animal, and matches are a slow and drawn-out slug fest. Just watching the footage you get a strong feeling of power coming from each ship; even from the corvette. This is a game that uses the darker, grittier style very well. Bright colors here would be distracting and overall unattractive; large ships like these should be menacing and overbearing, and painting them bright green or orange would distract from that and not feel right. Leave the majority of the color palette to fighters. That said, it would be nice if there were some customization available for your ships’ appearance and not just their loadouts. As I said, I love spaceships and in particular really care about space ship design. Letting me have some variability in my ships would be amazing, as well as the ability to name my ships (but I don’t believe that is possible either). White is really where I draw the line for “bright colors” on a capital ship. 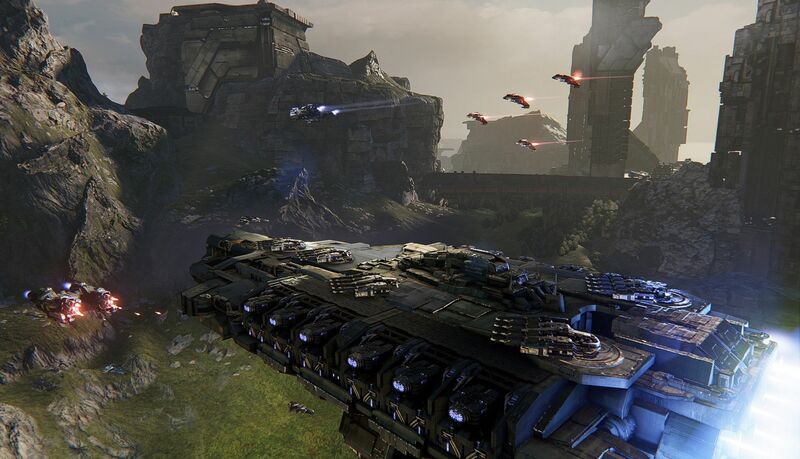 Dreadnought was supposed to be released early this year, but due to it being mid-March and the game still flying through it’s pre-alpha stage I assume we are more likely to see a mid-to-late 2015, early 2016 release. And there you have it! My top three PAXEast picks. Now comes the hard part; waiting for them all to be released.